The Petal Valve Marine Breakaway Coupling was specifically developed to aid the safe transfer of crude oil, heavy fuel oil and similar products. The MBC provides an identified safe parting point in marine hose transfer systems and activates in the event of an undue overload during tanker loading or discharging or an extreme pressure surge generated by the sudden, inadvertent closure of a valve downstream of the MBC. The MBC separation immediately relieves the acute tension in the transfer system and safely shuts down the product flow. The design parting load at which the unit activates is determined by the design parameters of the subject terminal operation, consultation with the world’s leading marine hose manufacturers and many years of field experience. The Petal Valve Marine Breakaway Coupling design has a full, smooth and uninterrupted bore providing zero headloss, eliminating pressure drop during product transfer or the necessity to increase power at the pumps to maintain original design flow rate. The fully sealed sleeved bore isolates the internal components of the device from the product flow or sea water, ensuring considerably reduced maintenance costs. In a marine environment where a loading or discharging vessel breaks from its mooring or in the event of an extreme pressure surge, the coupling separates when its pre-set parting load is exceeded. This activation relieves the tension and pressure in the transfer hose system before it can rupture. The purpose of the Petal Valve MBC is to greatly reduce the risk of marine pollution, damage to expensive capital equipment and costly vessel downtime. Floating hose strings at Single Point Mooring (SPM) systems including Catenary Anchor Leg Mooring (CALM) buoy/Single Anchor Leg Mooring (SALM) buoy terminals. Underbuoy hose strings at Single Point Mooring (SPM) terminals. Floating hose strings installed at Floating Storage and Offloading (FSO) and Floating Production Storage and Offloading (FPSO) tankers. Reeled Floating or in-air/submerged catenary hose strings installed at Floating Storage and Offloading (FSO) and Floating Production Storage and Offloading (FPSO) tankers. Conventional Buoy Mooring (CBM)/Multi Buoy Mooring (MBM) submarine hose strings. Articulated Loading Platform in-air or submerged catenary hose strings. Subsea high pressure live crude flexibles. Well choke and kill emergency disconnect systems. Other types of offshore hose transfer system. Compatible with all hydrocarbons including liquid gases. 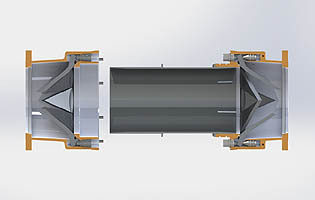 The experience and unique talents at Gall Thomson were applied to the design, development and extensive testing of the Petal Valve Marine Breakaway Coupling. Interestingly, several other companies have developed products to compete with the Gall Thomson MBC but all have failed, indicating the highly specialised nature of this market arena. Considerable investment and research resulted in a reliable system that delivers distinct benefits to a transfer system operating to the demands of legislation and the expectations of governments and modern commerce. In the event of a breakout, the device will operate without any outside intervention by personnel or system. Valve closure speed can be altered in service without dismantling unit. Completely self contained – no outside power source required. Activation due to linear overload and/or extreme internal pressure, providing surge protection. Simple petal mechanism – no axles, shafts, hubs or bearings to seize. Sealed internals until an activation occurs. Low weight – compact design. Fits between standard flanges at any recommended location in hose assembly. Variable closure speed gives anti-shock shut down. Dynamic parting loads can be varied to suit system. The Gall Thomson MBC is the only proven Petal Valve design in the world with the crucial advantage of a fully clear and smooth uninterrupted bore. This provides zero headloss, delivering enhanced production efficiency. Wear, erosion and corrosion is prevented during both normal pumping operations and seawater flushing due to the internal sleeve providing a fully sealed clear bore, ensuring that all valves and mechanisms are protected against exposure to product transfer. 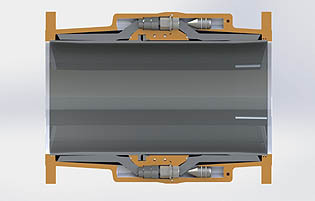 Exposed mechanisms can clog due to cooled or non-flowing viscous products such as crude oil. The sealed sleeve bore design of the Gall Thomson Petal Valve MBC ensures internal mechanisms are protected; eliminating the risk of clogging and promoting long life and low maintenance. The simple but effective petal mechanism minimises moving parts and components which means there are no axles, shafts, hubs or bearings to seize. This eliminates the risk of failure and reduces maintenance costs. The design ensures extended maintenance free periods of up to three to five years. The system eliminates the human element: it is self-motivated and self-energised. The shut-off is powered by the energy of the flowing product acting on the petal assembly. This means the unit is not vulnerable to the reliability of an external source power supply. The coupling can be re-instated after a parting incident or installed into a new hose string during a routine change out. Due to our rigorous quality procedures during the production process, our breakstuds have a reputation spanning over 30 years for delivering consistent field service reliability. The design ensures that operational loads such as bending moments, torsional stresses and cyclically applied loads created by constant wave and wind motion, tanker movement and pumping vibration are absorbed and have no adverse effects on function or condition. The clear and unobstructed bore allows for convenient and cost efficient internal line cleaning: eliminating the need to remove the unit from the hose string. The compact and lightweight design ensures there is no detrimental effect on the hose string. 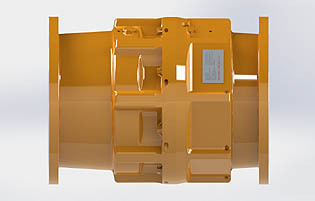 The diameter of the unit being smaller than the adjacent flanges and hoses therefore avoiding external mechanical damage and stress fatigue to adjacent hoses. Due to the MBC’s lightweight construction and the reserve buoyancy of the adjacent hoses, additional buoyancy aids are not always required when installed in a standard floating hose string and are very rarely required when installed in a submarine or catenary hose string. The unit is completely self-contained, requiring no outside systems. This eliminates dependency on other components or mechanisms. Careful consideration has been given to compatibility of materials with regard to chemical, mechanical and electrolytic reaction in adverse conditions. This, together with the absence of moving parts in its natural in-line position, ensures that the Marine Breakaway Coupling offers long periods of maintenance-free operation, as proven during several decades of successful field experience. The MBC valve has eight petals (two assemblies of eight in the case of double closure units). When the coupling separates following an activation, the extreme tension in the hose string is relieved and the segmented Petal Valves in the coupling close and shut off the product flow. This process is powered by the energy of the flowing product. Valve closure is powered by the energy of the flowing product acting on the petal assembly. Gall Thomson Petal Valve Controlled Closure Type fully activated. Sizes: 3″ to 24″ nominal bore. Safety breakaway with single or double, controlled or instantaneous, anti-pollution petal valve closure. Safety breakaway with anti-pollution petal valve closure and internal pressure stabilisation. Safety breakaway with internal pressure stabilisation only. Single controlled or instantaneous closure units are also available. Activation by internal pressure can be prevented – allowing breakaway only on dynamic loads, if required. Extensive testing of materials, combined with many years of field experience, ensures performance integrity and reliability in all environmental conditions.